I've only dabbled a bit with GS and intend to do more dabbling sometime - it's very cool, though I'm more of an Orbiter kind of guy. I just read Edward Belbruno's excellent new book "Fly Me to the Moon" which discusses his work with chaos theory applied to orbital mechanics and trajectory design. I wrote a review on Amazon (not up yet) and on my blog (http://flyingsinger.blogspot.com/2007/03/surfing-gravitational-field.html). In the review, I mention both Orbiter and GS 2.0 for readers who might like to play around with orbits themselves. I looked at the examples in GS2.0 and didn't see any that implied chaos, but I speculated that since the program can handle quite complex gravitational cases, that it probably could simulate some of Belbruno's trajectories. The question is: is this right?! And has anyone set up any of these? Belbruno has a 2004 technical book on this subject (Capture Dynamics and Chaotic Motions in Celestial Mechanics: With Applications to the Construction of Low Energy Transfers) and various papers, so I thought someone might have tried some of these things in GS. Some involve resonance, but in general the emphasis is on the interactions between gravitational fields that result in very sensitive trajectories, allowing big changes from small thrusts, as well as ballistic captures and escapes. Hi, FS. Welcome. I'm also an Orbiter fan. On their forum, I'm simply Tony. I know we've been involved in the same threads before over there. I haven't tried these trajectories yet, but I see no reason GS shouldn't be able to handle them. I don't have this book so I don't know what his trajectories are, but if you need help setting up a simulation, I'd be happy to help you. 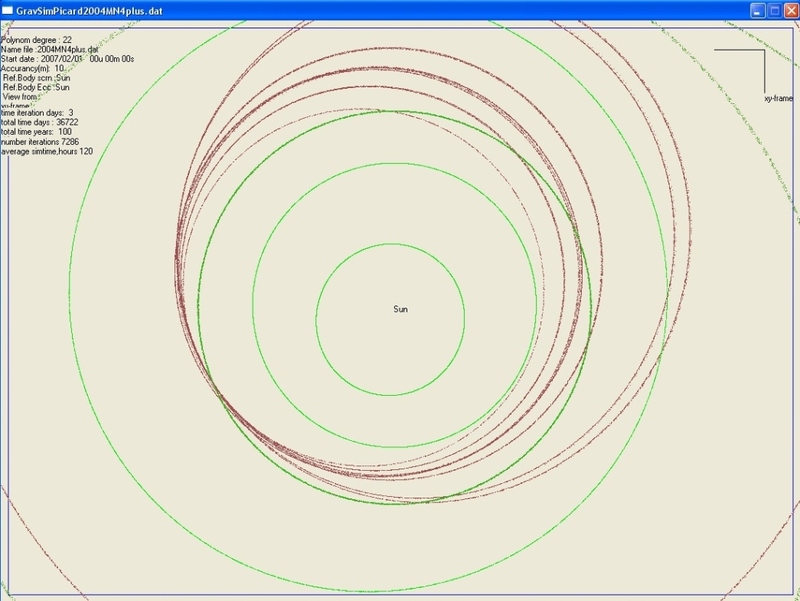 In Gravity Simulator, a good example of chaos can be seen by modifying the Apophis simulation. Create about 10 objects in a 1000 km sphere around Apophis a few days prior to its 2029 Earth encounter. (Objects>Create Objects, # of objects=10, reference object=Apophis, sma=1000 km, inc=180 +-100%, leave the rest at their defaults). Then fast forward to 2036, Apophis' next close Earth encounter and watch how the 1000 km differences in 2029 can turn into differences of millions of km in just 7 years. You can also see some mathamatical chaos by choosing different time steps. Simulations are only approximations, and by changing the time step, you're introducing a very small change that can be magnified with time. You'll notice that your results start to converge at time steps of 16 and less, meaning at slow time steps, the math-introduced chaos starts becoming insignificant in this particular simulation. I've got a more accurate version of the simulation than the one posted, if you are interested, but the posted one will definately show you a wide range of final positions created by the small differences in original positions. Also, setting up the New Horizons mission to Pluto can show you chaos. Days before the Jupiter approach, create a fleet of test particles around the New Horizons space probe, again, +- 1000 km, and watch how far apart they are by the time they get to Pluto. If you're interested, I could post the simulation. A small difference can make a big difference ...Take the example of the Apophis orbit as was mentioned above .The next picture may indicate what would happen if the Apophis orbit would deviate a little . 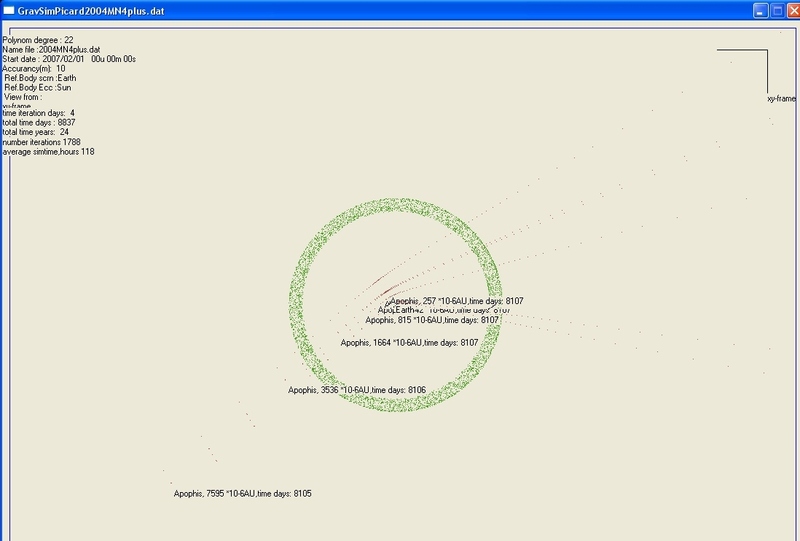 I created 6 additional small bodies around Apophis on 01/02/2007 , each having the same velocity as the mother . 2 of them were +/- 1000 km ahead or after in z . The picture shows what happens if they approach earth on Fri 13/04/2029 . The green circle around the earth is the orbit of the moon. The asteroids approach from the left under and go to the right above . If you look carefully you see seven points , 3 pairs and the mother Apophis in the middle .. The spread is really amazing ! Here's the screenshot of the "apophis neighbours " , vieuwed from above . The brown orbits are the orbits of Apophis + the neighbours . Earth must be the tirdth ellipse from the sun . One can count 6 brown orbits . One of them is the Apophis orbit before the close encounter in 2029. The other 5 are the orbits after the encounter . Where is the seventh orbit ? It seems that after a couple of months one of the neighbours collided with Apophis . Thanks for the feedback - sorry I haven't checked back for a while, I've been busy preparing for a trip to Taiwan (where I am now) to teach seminars and visit customers this week (optical engineering stuff, not as cool as space stuff, but it pays better). These examples look really cool and if you can see chaotic effects like these, I'm sure you can simulate Belbruno's stuff, though I don't have any starting parameters. This book is a "popular" treatment with a lot of sketches and explanations, but no orbital elements and such. I wrote to the author but have heard nothing. I imagine his original book has numbers and much more details on the math but I'm not ready to spend $50 on this quite yet since it's more of a curiosity thing. It looks like I should just play around with GS for starters to get a feel for it. It seems easy enough to set up scenarios. I've read through the HTML doc, good stuff but more of a reference. Has anyone done any sort of walk-through, like a case study or tutorial with specific steps? Has anyone done any sort of walk-through, like a case study or tutorial with specific steps? But each simulation is different. If you post what you're trying to do, I'll be happy to step you through it. I'm trying to simulate some of the oddly looping low-energy transfer orbits from Earth orbit to the Moon, and I found an interesting recent source on line, though it's huge (198 pages, 4 MB PDF, http://arxiv.org/pdf/astro-ph/0612386 by Leiva and Briozzo). It's an "atlas" of some 280 families of these orbits found by numerical search using a simplified 3-body model (Earth, Moon, tiny transfer mass), with a circular Moon orbit and some other simplifications. I got the Earth and Moon in there, and calculated real R and Vel vectors from their normalized figures for the very first case they give (family 357, page 14). This gave a quite elliptical orbit with apoapsis near the Moon, but all it did was precess around. The diagrams for these transfer orbits show some wild routing which I'd like to try to simulate in GS, but I'm probably missing something, possibly not having the initial position of the Moon at their assumed place (x= -a, y=0 I think). The framework/assumptions are on page 3, the sample orbits start on page 14, orbit diagrams for 357 on page 23, though the h values shown on the cool orbits don't quite match the ones in the table, and I'm not sure what the h parameter means, I only used the (x,y,vx,vy) scaled to real numbers by 384400 km and 1024 m/s (the z and vz were assumed to be zero by their setup assumptions). This is just my curiosity, but if you have any ideas (or your own curiosity), I'd appreciate any tips. I also wrote a blog post on GS tonight (http://flyingsinger.blogspot.com/2007/03/gravity-simulator-funky-music-of.html).